Metrics that Matter: What do you do with Roethlisberger? After focusing of my new favorite fantasy statistic, Actual Opportunity, in last week’s series of Metrics that Matter, today we’re turning our focus on Ben Roethlisberger’s glaring home/away efficiency splits. Over the past three seasons (min. 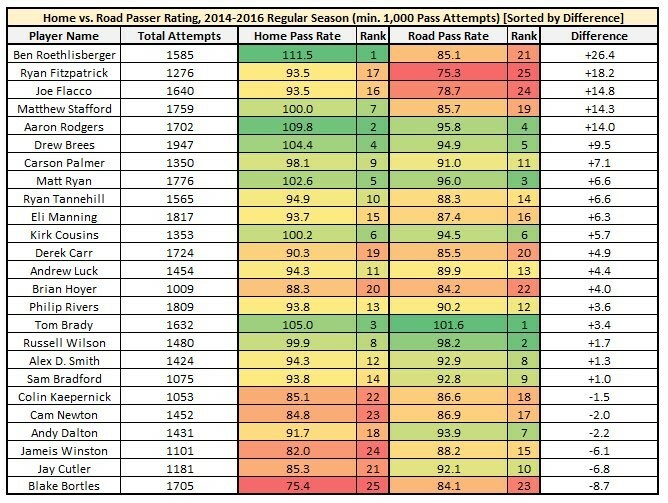 1,000 pass attempts), Roethlisberger ranks first in home passer rating and fifth-worst in road passer rating. This equates to being the largest discrepancy among all quarterbacks over this span. In Roethlisberger’s last 20 home games, he’s totaled 58 touchdowns and 19 interceptions, and averaged 331.7 yards per game. In Roethlisberger’s last 20 away games, he’s totaled 19 touchdowns and 19 interceptions, and averaged 278.5 yards per game. This equates to a difference of almost 2.0 fewer touchdowns and 53.2 yards per game. Typically, I’m wary of home/away splits. When looking at players in the NFL, we have a small sample size of only 16 games per season. In the MLB, for instance, samples are far more robust, looking at 162 games. For fantasy football, we can always twist numbers to produce outliers when given any variety of splits, but not all of them are meaningful. For instance, throughout their careers, Odell Beckham Jr. averages 6.0 fantasy points per game more in even-numbered weeks, while Mike Evans averages 5.9 fantasy points per game in odd-numbered weeks. Obviously, these statistics are irrelevant for our projections, but imagine if these splits were in home/away games rather than odd/even weeks. Fantasy analysts would never be able to shut up about it. Fantasy points, total points, and player efficiency tend to be much better at home in general (this is why Vegas spots away teams 2.5 points when making lines) – so we should bake this in to our projections – but Roethlisberger’s disparity here is so alarming (and over a large enough sample) that I have trouble chalking this up to variance alone. So, what does this mean for fantasy? Unfortunately, because I buy into the validity of these statistics, this means Roethlisberger is no longer an every-week fantasy starter. Over the past three seasons, Roethlisberger has ranked fifth, eighth, and seventh in fantasy points per game. In 2017 fantasy drafts, he is likely to get selected near that range. Only looking at his away-game average, he would have ranked 36th, 36th, and 38th. Although he is likely to finish as a top-10 fantasy quarterback, you’re probably better off streaming or playing your backup quarterback during Pittsburgh road games. As for why this might be the case, I’m not sure. Former NFL offensive lineman Ross Tucker wrote a fantastic article explaining why home-field advantage matters so much for NFL players. Why the effects for Roethlisberger are so much more dramatic, I’m not really sure. However, I don’t think this accounts for bulk of our concern with Roethlisberger. As it stands, I’m mostly avoiding Roethlisberger in fantasy leagues (unless I can get him cheaply and pair him with a highly competent QB2) due to these inconsistencies. In DFS, I’ll likely never play Roethlisberger on the road, but will give a slight edge to Le’Veon Bell when the Steelers are traveling due to his (surprisingly) improved efficiency when on the road and these attractive play-calling splits near the end zone.